Signs have been the most common form of advertising and direction-giving device man has used. They are cost effective to produce and offer a lot of leeway for customisation. They also play an indispensable role in the field of tourism, urban planning, and marketing. But what can a good sign actually do for your growing business? More often than not, customers always say that they've learned about the opening of a shop or a specific store promo because of an on-premise sign. Start-ups also attribute half of their customers to signs they've put up, and admit that around 35% of passers-by wouldn't recognise their business without a sign. According to studies, adding or changing a sign directly increases businesses' profits from sales or services. Strategic sign locations and a well-thought design also add to profitability opportunities in most industries. Because signs relatively cost less to fund than mass media commercials and ads, enterprises can save on marketing expenses and will also result in an upward movement in their bottom line. Signs are effective tools for advertising and for making your own brand stand out, especially for local and small- to medium-scale businesses. However, businesses also need to remind themselves that the vision and content execution of their signs would make the most difference in this competitive market. 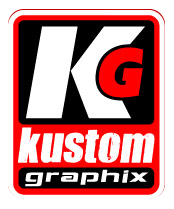 KustomGraphix use the latest technologically advanced graphic and signage printing systems with superior quality product providing the highest quality results. Our signs and graphics not only look fantastic inside or out, they stay looking like new longer.